As a parent, there are several things you can do to enhance your child’s active listening skills. Do you want to improve your child’s active listening skills? Listening is an integral part of learning and succeeding in the classroom. Also, practicing active listening will make you a better communicator. 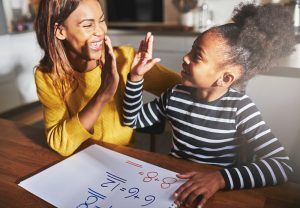 As a parent, there are several things you can do to enhance your child’s active listening skills. It is important that you set an example when you are communicating with them. By doing so, it should help your child to pick up on some good listening habits. One of the best ways to improve your child’s active listening skills is to a ask them question throughout your conversations with them. This shows to your child that you are engaged in what they are saying to you. By asking questions, you are also getting clarification through open-ended and closed-ended questions. When you are teaching your child about manners, you need to stress the importance of not interrupting others when they speak. This is something many young children struggle with because they are still learning how to be patient. When your child is telling you a story or about their day, you shouldn’t interrupt them until they are done speaking. If you do so, you set a terrible example. It shows to your child that it is okay to cut people off as they talk. It is important for children to learn the importance of making eye contact during a conversation. By making eye contact, you are showing the other person that you are confident, trustworthy, and engaged in the conversation. If you are not making eye-contact with the other person, you are suggesting that you don’t care what the other person is saying, which comes off as rude. When you are speaking to your child, be sure you frequently make eye contact with them. This entry was posted on Friday, May 25th, 2018	at 9:32 am	. You can follow any responses to this entry through the RSS 2.0 feed. Both comments and pings are currently closed.